Newer GE MR 450W systems come with the GEM suite. Somewhat similar to Siemens' TIM (Total Imaging Matrix) technology, this allows each GEM coil to be used individually, or in combination with other GEM coils for whole-body imaging without the need to move the patient or exchange coils. The 70 cm bore of the MR 450W, along with its "feet first" imaging capability, gives it an advantage in patient comfort. Its OpTix RF system improves image quality by creating a higher ratio of signal to image noise- a very important clarity benefit for cardiac and neurological studies. While the EXCITE platform topped out at 18 RF channels, the Optima 450W with GEM comes with 32 RF channels- a feature that can significantly boost speed and image quality. The 450W also has an edge on the HDXT in helium consumption, as the model is the first to set aside GE's long-standing CXK4 magnet design for a new, more efficient design. Simply put- because it is a newer system, the MR 450W has the advantage of more years of advances in MRI technology. 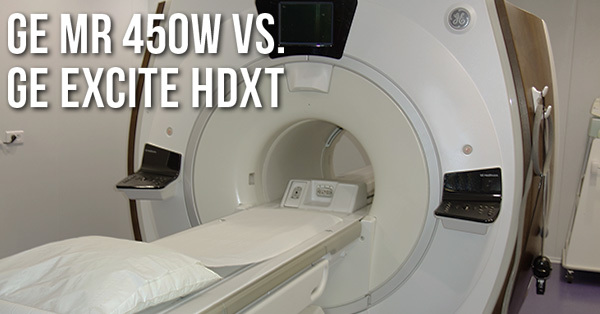 While it's true that the HDXT isn't as technologically advanced as the MR 450W, the system can be a strong value for imaging facilities in other ways. The HDXT is far more readily available on the secondary market, and at significantly lower price points. If the typical workload of your future MRI will be more generalized, the HDXT offers a more affordable entry point. If you have the money, the MR 450W is late-model technology capable of performing whole-body scans in much less time and with more convenience for both technologist and patient. It's wonderfully-suited to cardiac, breast, and neurological studies, and its wider bore provides greater patient comfort. If your budget is subject to more limitations, or if you intend to perform mostly orthopedic studies, the EXCITE HDXT is a solid alternative that won't see you paying for capabilities above and beyond what you'll typically use. Whatever MRI model your facility ends up choosing, our team is standing by to help you find the best fit. To learn more about either of these systems, or other MRI models, use the button below to tell us what you'd like to know. Steve Rentz is the Product Manager for MRI Scanners at Block Imaging. He is also a husband, father of 3, triathlete, woodworker, and barbecue master. 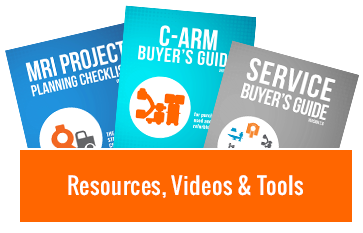 Steve’s goal is to earn each customer’s trust and business by specifically addressing the needs of their unique project.